Two aged magicians set upon a task of pitting their two proteges, Ceilia and Marco, in a magical contest. The backdrop to this battle? The mysterious and fantastical Cirque des Rêves (or the Circus of Dreams) created solely for the purpose of being the stage for which the two will demonstrate and eventually fight for their lives. 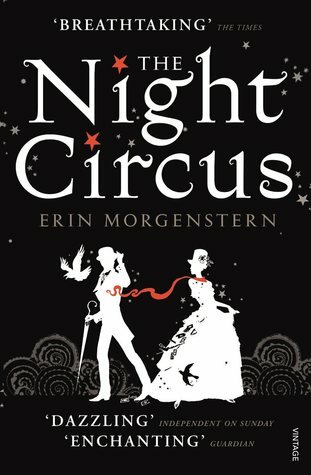 The Night Circus is probably one of the most unusual books I've reviewed for Blogger's Bookshelf and is actually quite hard to describe. The book itself is very slow to start and not a novel you can consume quickly or in one sitting (which I certainly didn't). The plot lacks a bit of ompf and the conclusion felt a bit rushed and though satisfying, would've been resolved much quicker and with more cohesion. In a way, much like the way the Circus is portrayed, the book does often feel like a dream, cutting to and from narratives, timelines and perspectives. Marco and Ceilia's story also feels a little disjointed. Their contest actually doesn't play too much of a role until the very end and their romance is not actually as big of a deal as the blurb likes to make out. What the book lacks in plot it majorly makes up in gorgeous, wonderful and blissfully indulgent description. A lot of reviews comment that you cannot analytically review The Night Circus and I totally agree. There is no doubt Morgenstern holds incredible command over language. Many passages of the book are so beautiful and so richly detailed without it feeling too heavy and a burden to the reader - as can be the case with flowery fantasy novels. It's not action packed or cinematic in the traditional sense, in a way it was almost like a Wes Anderson film in novel form: quirky, a bit weird, some parts don't make much sense but GOD are the aesthetics amazing. I have no doubt that this is book will divide readers - you'll either love it or hate it, there seems to be no middle ground here - though if you're a writer I would highly recommend reading this simply to revel in the writing itself. In a way, in hindsight, I'm grateful that I took my time with this. It demands your attention, not for the plot but for the subtle intricacy within the language itself and it's a truly fantastic example of modern magical realism. For lovers of...The Imaginarium of Doctor Parnassus, Amelie, and the Discworld series.